Definition at line 244 of file lloctree.h. Reimplemented in LLOctreeRoot< T >. Definition at line 247 of file lloctree.h. Definition at line 256 of file lloctree.h. Definition at line 254 of file lloctree.h. Definition at line 253 of file lloctree.h. Definition at line 252 of file lloctree.h. Definition at line 250 of file lloctree.h. Definition at line 249 of file lloctree.h. Definition at line 248 of file lloctree.h. Definition at line 255 of file lloctree.h. Definition at line 251 of file lloctree.h. Definition at line 258 of file lloctree.h. Definition at line 259 of file lloctree.h. References LLOctreeState< T >::getChild(), LLOctreeState< T >::getChildCount(), and i. Definition at line 282 of file lloctree.h. Definition at line 281 of file lloctree.h. Definition at line 268 of file lloctree.h. Referenced by LLOctreePick::check(), LLOctreeRenderNonOccluded::traverse(), and LLOctreeTraveler< T >::traverse(). Definition at line 520 of file lloctree.h. References LLOctreeNode< T >::getCenter(), LLOctreeState< T >::getChildCount(), LLTreeNode< T >::getListenerCount(), LLOctreeNode< T >::getOctListener(), LLOctreeState< T >::getOctNode(), LLOctreeNode< T >::getSize(), LLOctreeListener< T >::handleChildAddition(), i, llendl, LLOctreeState< T >::mChild, and OCT_ERRS. Referenced by LLOctreeRoot< T >::balance(), LLOctreeRoot< T >::insert(), and LLOctreeState< T >::insert(). Definition at line 506 of file lloctree.h. Referenced by LLOctreeNode< T >::balance(). Definition at line 575 of file lloctree.h. References LLOctreeNode< T >::deleteChild(), LLOctreeState< T >::getChildCount(), LLOctreeState< T >::getElementCount(), LLOctreeState< T >::getOctNode(), and LLOctreeNode< T >::getOctParent(). Referenced by LLOctreeState< T >::remove(), LLOctreeState< T >::removeByAddress(), and LLOctreeState< T >::removeChild(). Definition at line 485 of file lloctree.h. Referenced by LLOctreeRoot< T >::balance(), LLOctreeRoot< T >::insert(), and LLOctreeState< T >::LLOctreeState(). Definition at line 588 of file lloctree.h. References LLOctreeState< T >::getChild(), LLOctreeState< T >::getChildCount(), i, llendl, OCT_ERRS, LLOctreeState< T >::removeChild(), and TRUE. Referenced by LLOctreeNode< T >::deleteChild(). Definition at line 511 of file lloctree.h. References LLOctreeState< T >::getChildCount(), i, and LLOctreeState< T >::mChild. Referenced by LLOctreeNode< T >::destroy(), and LLOctreeState< T >::removeChild(). Definition at line 277 of file lloctree.h. Definition at line 276 of file lloctree.h. Referenced by LLOctreeState< T >::deleteChild(), LLOctreeNode< T >::getChild(), LLOctreeState< T >::insert(), LLOctreeState< T >::removeByAddress(), LLOctreeState< T >::removeChild(), LLOctreeRenderNonOccluded::traverse(), LLOctreeTraveler< T >::traverse(), and LLOctreeState< T >::~LLOctreeState(). Definition at line 275 of file lloctree.h. Referenced by LLOctreeState< T >::addChild(), LLOctreeState< T >::checkAlive(), LLOctreeCull::checkObjects(), LLOctreeState< T >::deleteChild(), LLOctreeState< T >::destroy(), LLOctreeNode< T >::getChildCount(), LLOctreeRoot< T >::insert(), LLOctreeState< T >::insert(), LLOctreeState< T >::removeByAddress(), LLOctreeRenderNonOccluded::traverse(), LLOctreeTraveler< T >::traverse(), LLOctreeState< T >::validate(), and LLOctreeState< T >::~LLOctreeState(). Definition at line 279 of file lloctree.h. Definition at line 278 of file lloctree.h. Definition at line 273 of file lloctree.h. Definition at line 272 of file lloctree.h. Referenced by LLSpatialGroup::boundObjects(), LLOctreeSelect::processGroup(), LLOctreePick::visit(), LLOctreeRenderNonOccluded::visit(), and LLOctreeGet::visit(). Definition at line 271 of file lloctree.h. Referenced by LLOctreeState< T >::checkAlive(), LLOctreeCull::checkObjects(), LLOctreeNode< T >::getElementCount(), and LLOctreeState< T >::insert(). Definition at line 291 of file lloctree.h. References LLOctreeNode< T >::contains(), FALSE, LLOctreeNode< T >::getChild(), LLOctreeNode< T >::getChildCount(), LLOctreeState< T >::getNodeAt(), LLOctreeNode< T >::getOctant(), LLOctreeState< T >::getOctNode(), LLOctreeNode< T >::getParent(), LLOctreeNode< T >::getSize(), i, LLOctreeNode< T >::isInside(), LLVector3d::mdV, and TRUE. Definition at line 286 of file lloctree.h. Referenced by LLOctreeState< T >::getNodeAt(), LLOctreeNode< T >::getNodeAt(), and LLOctreeState< T >::remove(). Definition at line 284 of file lloctree.h. Definition at line 283 of file lloctree.h. 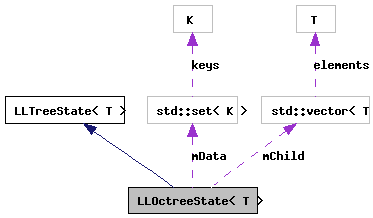 Referenced by LLOctreeState< T >::addChild(), LLOctreeState< T >::checkAlive(), LLOctreeState< T >::getNodeAt(), LLOctreeRoot< T >::getOctNode(), LLOctreeState< T >::insert(), LLOctreeState< T >::remove(), LLOctreeState< T >::removeByAddress(), LLOctreeState< T >::removeChild(), and LLOctreeState< T >::validate(). Definition at line 327 of file lloctree.h. References LLOctreeState< T >::addChild(), LLOctreeNode< T >::contains(), LLOctreeNode< T >::getCenter(), LLOctreeState< T >::getChild(), LLOctreeState< T >::getChildCount(), LLOctreeNode< T >::getElementCount(), LLOctreeState< T >::getElementCount(), LLOctreeState< T >::getOctNode(), LLOctreeNode< T >::getOctParent(), LLOctreeNode< T >::getSize(), i, LLOctreeState< T >::insert(), LLTreeNode< T >::insert(), LLOctreeNode< T >::isInside(), LL_OCTREE_MAX_CAPACITY, llendl, llwarns, LLOctreeState< T >::mChild, LLOctreeState< T >::mData, LLVector3d::mdV, NULL, OCT_ERRS, LLOctreeNode< T >::pushCenter(), and size. Definition at line 269 of file lloctree.h. Referenced by LLOctreeNode< T >::hasLeafState(). Definition at line 430 of file lloctree.h. References LLOctreeState< T >::checkAlive(), LLOctreeState< T >::getNodeAt(), LLOctreeState< T >::getOctNode(), LLOctreeNode< T >::getOctParent(), LLOctreeNode< T >::isInside(), llendl, llwarns, LLOctreeState< T >::mData, LLTreeNode< T >::notifyRemoval(), NULL, LLTreeNode< T >::remove(), and LLOctreeNode< T >::removeByAddress(). Definition at line 467 of file lloctree.h. References LLOctreeState< T >::checkAlive(), LLOctreeState< T >::getChild(), LLOctreeState< T >::getChildCount(), LLOctreeState< T >::getOctNode(), i, llendl, llwarns, LLOctreeState< T >::mData, and LLTreeNode< T >::notifyRemoval(). Referenced by LLOctreeNode< T >::removeByAddress(). Definition at line 556 of file lloctree.h. References LLOctreeState< T >::checkAlive(), LLOctreeState< T >::destroy(), LLOctreeState< T >::getChild(), LLTreeNode< T >::getListenerCount(), LLOctreeNode< T >::getOctListener(), LLOctreeState< T >::getOctNode(), LLOctreeListener< T >::handleChildRemoval(), i, and LLOctreeState< T >::mChild. Referenced by LLOctreeState< T >::deleteChild(). Definition at line 490 of file lloctree.h. References LLOctreeState< T >::getChildCount(), LLOctreeState< T >::getOctNode(), i, llendl, llerrs, and LLOctreeState< T >::mChild. Referenced by LLOctreeNode< T >::validate(). Definition at line 603 of file lloctree.h. Referenced by LLOctreeState< T >::addChild(), LLOctreeRoot< T >::balance(), LLOctreeState< T >::clearChildren(), LLOctreeState< T >::destroy(), LLOctreeState< T >::getChild(), LLOctreeState< T >::getChildCount(), LLOctreeState< T >::getChildren(), LLOctreeState< T >::insert(), LLOctreeState< T >::isLeaf(), LLOctreeState< T >::removeChild(), and LLOctreeState< T >::validate(). Definition at line 604 of file lloctree.h. Referenced by LLOctreeState< T >::getData(), LLOctreeState< T >::getElementCount(), LLOctreeState< T >::insert(), LLOctreeState< T >::remove(), and LLOctreeState< T >::removeByAddress().